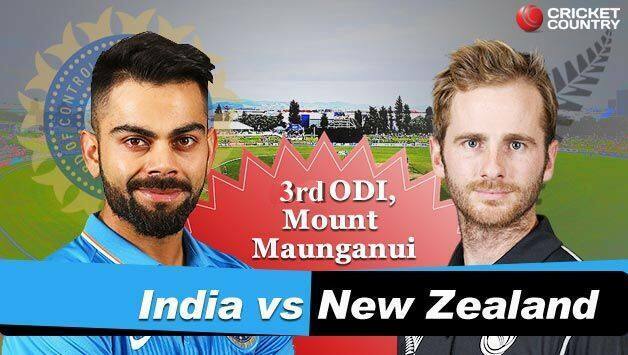 India vs New Zealand 2019, 3rd ODI: LIVE cricket score of India vs New Zealand at the Bay Oval, Mount Maunganui, News, latest updates, live streaming, coverage and highlights. 14:48pm: All Over! India win their first ODI series in New Zealand in 10 years. With four needed to win, Doug Bracewell bowled a wide bouncer than beat Tom Latham for FIVE WIDES. Fine, fine win this. They have outclassed New Zealand third time in a row this series. Watch out teams, India are the team to beat heading into the World Cup. As Sunny G rightly said on air, this time is not just winning for the World Cup. This team wants to WIN, WIN, WIN. And we can’t argue with it. Stupendous stuff from the No. 2-ranked side in the world. 14:43pm: Easy pickings for India, who are now just 17 away from sealing the series. Oh wait! Make that 4 needed. Dinesh Karthik has tonked 13 runs off Ish Sodhi. India 240/3 in 43 overs. Will the next over signal the end of the match? 14:14pm: 200 up for India, with Dinesh Karthik and Ambati Rayudu taking India forward. There’s been so much talk surrounding Rayudu, how he can be the answer to India’s No. 4 dilemma. So far, the numbers haven’t been too promising. Last game, he got a start but fell in the 40s. India may well be on top at the moment but Rayudu can use this opportunity to get some runs under his best. He’s looked a lot more confident today striking three fours and a six and would want to stay there till the end to see India through. 14:02pm: Meanwhile, the ICC has suspended Ambati Rayudu from bowling in international cricket. For those not aware, Rayudu was detected with a suspect bowling action during the first ODI against Australia earlier this month. As per an ICC media release, Rayudu elected not to submit to a test of his bowling action within the stipulated period of 14 days of being reported for a suspect action, and therefore he has been suspended with immediate effect in accordance with clause 4.2 of the ICC regulations. The suspension will remain in place until he is tested, and can demonstrate he is able to bowl with a legal action. 13:55pm: OUT! Kohli hits a drive straight to Henry Nicholls at covers, he goes for 60. The first time in a while that Kohli won’t have a century in an ODI series. Full and wide from Trent Boult and Kohli goes for a booming drive, unable to keep it down. What a move by Williamson to bring back Boult. India 168 for 3, need another 76 to win. 13:44pm: WICKET! India 152/2 as Mitchell Santner gets Rohit Sharma out stumped. Well, against the run of play, New Zealand have gotten a breakthrough. It was slower, it was tossed up by Santner, enough to lure Rohit out of the crease and go for a big one. With the ball turning away, the opener tried to heave it toward midwicket but failed to put bat on ball. He was so far down the wicket there was no chance of getting back in. Latham did the rest. 13:33pm: HALF-CENTURY No. 49 for India captain Virat Kohli, comes off 59 balls. India 143/1 in 26.1 overs. 13:16pm: FIFTY for Rohit Sharma off 63 balls, his 39th in ODIs. India cruising at 118/1 after 23 overs. 13:01pm: There is hardly a sight better in international cricket than watching Rohit Sharma and Virat Kohli bat together, and the Bay Oval is witnessing them guiding India’s chase smoothly. After 20 overs, they have taken the score to 103 for 1 with both Kohli and Rohit looking in no trouble whatsoever. Here’s an interesting TRVIA: Kohli has fallen in the 40s in the last three ODIs. The last time Kohli went without century in FOUR ODI innings was in September 2013. That’s how dominating he has been! 12:26pm: Fifty up for India after 12 overs. Despite the wicket of Dhawan, Rohit Sharma and Virat Kohli seem to be taking control of the proceedings and looking at ease. Rohit welcomes Mitchell Santner by dancing down the wicket and dispatching the left-arm spinner straight over the boundary for a six. 12:23pm: Edged and Gone! It’s Shikhar Dhawan who has to depart after a promising start; edges Trent Boult to Ross Taylor at first slip. Trent Boult draws first blood for New Zealand. India 39 for 1. End of Over 5: A positive start from India in chase of 244 to reach 31/0 after 5 overs. Shikhar Dhawan looking in fabulous touch, cracking five boundaries to reach 22 off 17. 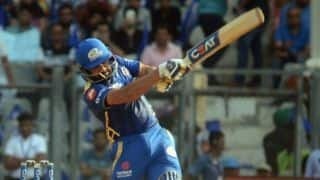 Rohit unbeaten on 9 off 16 with one four. Innings summary: Although New Zealand fared better against spin, going from 178 for 3 in the 38th over to getting bowled out for 243 would be disappointing for them. Ross Taylor held the innings together and forged a 150-run stand with Tom Latham for the fourth wicket. But once that partnership was snapped, a familar narrative unfolded. Once again, Mohammed Shami did bulk of the damage, taking 3 for 41 from nine overs. India need 244 to win their first bilateral series in 10 years. Will they get there? Join us soon for the second innings. 11:18am: ALL OVER! For the third time in the series, New Zealand have failed to last 50 overs. India bowl them out for 243 with Mohammed Shami picking up three wickets. Trent Boult is the last man out, caught at third man off Bhuvneshwar. 11:11am: India pick two more wickets towards the end. An eventful 48th over bowled by Shami, who picks up his 3rd wicket. 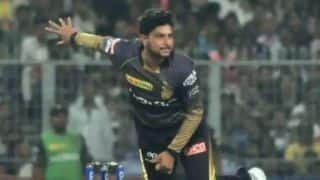 A six from Ish Sodhi was followed by Virat Kohli dropping an easy catch at long-on before getting him eventually next ball with the India captain not missing it the second time around. A run out off the very next delivery – Doug Bracewell has New Zealand nine down for 238. 10:58am: WICKET! GONE… Edged and caught behind. Shami strikes first ball of his new spell. Trying to glide it, Ross Taylor edges the ball to Dinesh Karthik and he is out for 93. Big wicket for India. Taylor was the glue that held this innings together and just when he seemed to be launching himself for an assault, India have gotten the breakthrough. New Zealand 222 for 7, and India seem to be seizing the advantage. 10:38am: WICKET! Another one goes. India are coming back strongly after that century stand between Latham and Taylor. Second wickets in two overs for Hardik Pandya. 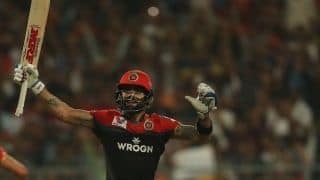 Length ball outside off and Santner edges it to Dinesh Karthik. New Zealand lose their sixth wicket for 198, the last three falling for 20 runs. 10:18am: WICKET! Hardik Pandya gets his first wicket since the Asia Cup. Pitches it short and Henry Nicholls, going for the pull, gloves it to Dinesh Karthik. A short stay for him as New Zealand lose their fifth wicket for 191. 10:17am: WICKET! Tom Latham is out, a ball after getting to his fifty. New Zealand 178 for 4 in 37.3 overs. India strike back. This partnership of over a 100 was really beginning to get the better of India but Yuzvendra Chahal breaks it. New Zealand decided to get a move on but it was a wrong shot Latham chose. 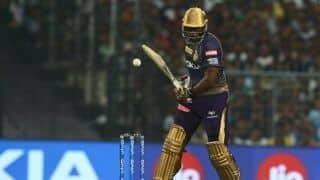 He comes down the wicket and chips the ball towards deep midwicket where Ambati Rayudu took a catch. 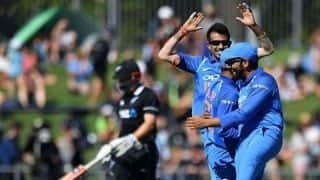 Timely breakthrough for India just when New Zealand were threatening to get away. 10:o6am: 100 partnership up between Ross Taylor and Tom Latham, their first century stand of the series and a much-needed one. New Zealand march on. Latham follows it with a six off a full toss from Kuldeep Yadav. 10:00am: WHAM! Back-to-back half-centuries and that would bring up a half-century for Ross Taylor. A fine effort from him with the series on the line. It’s no mystery he’s been in remarkable form over the last two years, and despite the low scores in the first two ODIs, it was just a matter of time before he came into his elements. New Zealand attaining momentum, reaching 149 for 3 after 33 overs. 9:26am: The 100 comes up for New Zealand, but it’s taken them a long time to get there, almost 26 overs. Tom Latham looking comfortable. In fact, the most comportable any New Zealand batsmen has looked against Chahal and Kuldeep. 50 of the partnership comes up between Latham and Taylor with a boundary. New Zealand just beginning to gain some momentum here. 9:15am: FOUR! Latham sweeps Kuldeep to get New Zealand’s first boundary after 12 overs. That’s quite something! 9:10am: Almost a wicket! The slow nature of the surface almost does in Tom Latham as the ball almost lobs back to Shami. The bowler, in his follow through, was moving in the opposite direction and hence couldn’t quite position himself to get back to the ball in time. New Zealand 84 for 3 in 23 overs. 8:57am: 20 gone and New Zealand are 70 for 3. The wicket of Williamson was a big blow for them, and a boost for India. The visitors are applying pressure by not conceding too many runs. Tom Latham and Ross Taylor once again have a huge task ahead for New Zealand. The things that bodes well for the home team is that Latham has looked good in both the earlier matches. 8:34am: New Zealand reach 58 for 2 in 15 overs. Plenty of chattering taking place. Rohit Sharma from first slip is directing plenty of instructions to the bowler regarding the effect of wind and what line to bowl. Williamson and Taylor looking steady but India are applying pressure by not giving away too many runs. New Zealand need them to play out most overs; especially Taylor who hasn’t fired so far in the series. 8:25am: Ah, silken stuff from Williamson, whips Yuzvendra Chahal for a boundary which brings up the 50 for New Zealand. Hardik Pandya bowled one over before being replaced by Kuldeep Yadav. 8:12am: Eight overs gone and India have kept things tight giving away just 37 runs and picking up two wickets. First sign of spin, Yuzvendra Chahal handed the ball. A tidy over spoiled by a loose last delivery, which Williamson dispatches away for 4. 7:58am: WICKET! Another edge, another dismissal. Bhuvneshwar Kumar gets Martin Guptill out caught behind. Slightly wide from Bhuvneshwar and Guptill edges an expansive drive for Dinesh Karthik to take a regulation catch. Guptill was looking promising but that’s all she wrote. New Zealand 26 for 2 and India have once again removed the openers cheaply. 7:50am: First SIX of the match. Too full from Bhuvneshwar, slides on to the pads of Guptill and the New Zealand flicks it effortlessly into the crowd towards the cow corner, almost like a helicopter shot. Follows it with another flick, this time towards the gap between long on and mid wicket for a boundary. Guptill looking far better than he did in the first two matches, puts pressure on Bhuvneshwar. New Zealand 22/1 after five overs. 7:40am: WICKET! And this time the catch is taken. Identical delivery and an identical shot but this one carries straight to Rohit Sharma at first slip and he makes no mistake. India strike early again, Mohammed Shami with the wicket. New Zealand 10/1 after 2 overs. And what more? Bhuvneshwar Kumar follows it up with a maiden. 7:37am: EDGED and PUT DOWN! First drop of the match as a diving Dinesh Karthik fails to grabh on to a low catch of Colin Munro. Earlier in the over, the left-hander took Shami for his first boundary down the ground. 7:34am: Bhuvneshwar and India off to a tidy start. Four singles off the first over. New Zealand have stuck with Colin Munro and Martin Guptill as their openers. So far, they have not been able to get New Zealand off the blocks, while one of Bhuvneshwar and Shami have fetched India an early breakthrough. Who will rule this period today? 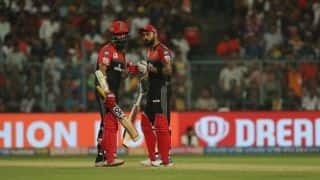 Virat Kohli: Same thing, we would’ve wanted to bat first. This pitch will get slower and slower but under the lights, we felt the ball came on better, we won’t mind bowling first. 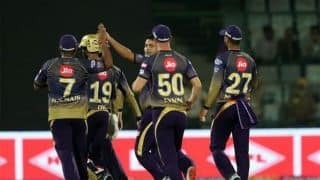 We were quite satsified, still it’s the middle overs, setting a target we would like to improve on. I personally would like to get the scoring rate up. In the last game, we could’ve got to 340. Couple of changes. 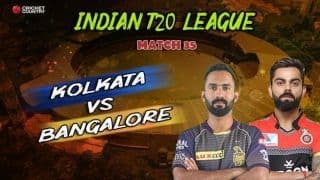 MS has got a sore hamstring, so he misses out this game, Karthik comes back. Hardik comes in place of Vijay Shankar. He brings great balance to the team. He can give you 5-6 overs and also play the big shots as well. It’s brilliant, especially if you look at our away performances. It’s great to have two guys (Kuldeep and Chahal) who can pick wickets in the middle overs. They are one of the main reasons why we have played such consistent cricket. Kane Williamson: We are going to bat. Looks like a good surface, a used surface so hopefully we can make use of the first hour. One change for us. Santner comes in for Colin de Grandhomme. The spin throughout the series has been effective. This pitch will also help the spinners I guess. 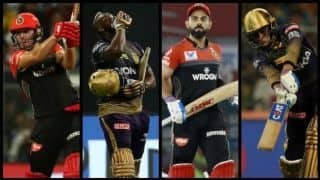 There has been glimpses, we need to get some partnerships with the bat and need to step up. We do know that If we play our best cricket, we can beat anybody. It’s important we execute our plans as best as we can. Now then: TWO changes for India. 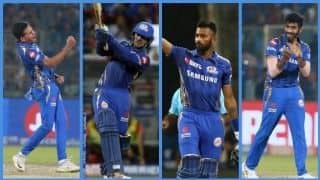 The biggest: Hardik Pandya back in the Playing XI in place of Vijay Shankar. This is Pandya’s first international game since Septemeber when he was injured midway through the Asia Cup. The other big change is that MS Dhoni has been rested with a sore back and Dinesh Karthik takes his place. 7:07am: TOSS – > New Zealand have won the toss for the second time in the series and skipper Kane Williamson has opted to bat first. In the only change from the previous ODI, New Zealand have replaced allrounder Colin de Grandhomme with left-arm spinner Mitchell Santner. 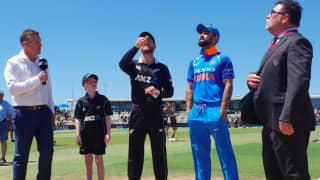 6:30am: Hello and welcome to LIVE coverage from the third ODI between India and New Zealand at the Bay Oval in Mount Maunganui. After two dominating wins against a hapless New Zealand still searching for answers, a confident India will aim to take an unassailable 3-0 series lead. 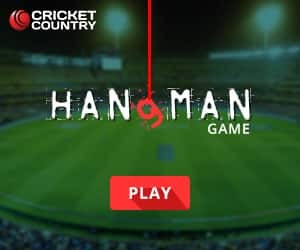 However, the Black Caps will be eager to dish out a strong performance to prevent the tourists from winning only their second series in the last 10 years. Captain Virat Kohli has the chance to add one more feather in his captaincy hat, while eyeing a fine contribution from himself following which he has been rested for the remaining two ODIs and the subsequent three-match T20I series. Rohit Sharma will lead the side in his absence. Narula: When and who presses the acceleration button for India?